Top Shelf Productions is one of those companies that the comics industry needs, with a wonderfully diverse line-up of books, from children's books by Andy Runton and James Kochalka to more adult fare by Alan Moore and Jeff Lemire. 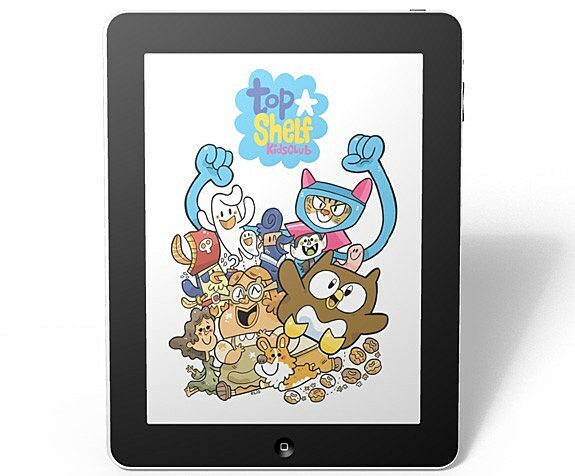 Starting today, Top Shelf is increasing their digital presence, with the introduction of two dozen books on Graphicly and ComiXology and dozens on Google Books and Apple's iBooks (iTunes link) in addition to their already considerable catalog on iVerse's Comics+. 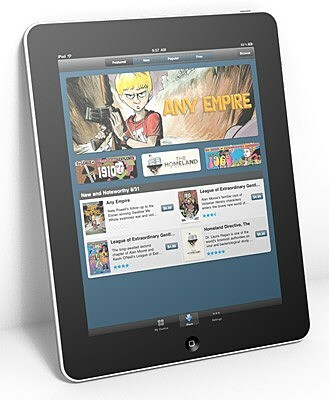 The icing on the cake is the launch of two iOS apps, Top Shelf and Top Shelf Kids Club, which are powered by ComiXology and a week-long sale on select titles. After the cut, we're taking a walk through Top Shelf's digital presence and checking out what they're getting right. As a part of their improved digital presence, Top Shelf is running a week-long sale on a few of their greatest hits. This sale is going to be in effect across the spectrum of Top Shelf apps. Right now, digital comics stores are in a funny place. If you read a review of a comic and decide to buy it, you have to go through several steps to get it. Generally, you have to download a third-party app (such as Graphicly, Comics+, or ComiXology) and then browse or search for the comic you want. It's the equivalent of going to Best Buy and then to a smaller, independent Apple store inside the Best Buy in order to buy a new laptop. It makes sense, since the third-party distributors provide the software and a certain measure of public visibility. It's a system that makes it easy for readers to find new comics, and provides a centralized place for readers to keep their books. 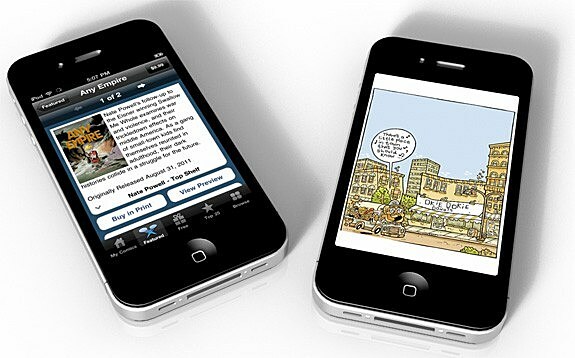 But putting digital comics where the most people can find them will be critical to their success. Comic books and manga found success once they hit bookstores and became available to everyone, not just direct market customers. , Comics are just books with pictures, and it makes sense to put them where you can find other books. Top Shelf's big push this week makes their books available on two major ebook sites: Apple's iBooks and Google Books. This removes the need for a third-party app and broadens Top Shelf's reach. It just makes sense to search iBooks or Google for a book you've just heard about, since both Apple and Google have managed to intertwine themselves into our daily life in a major way. Meanwhile, readers who are already familiar with the Top Shelf brand can download two different Top Shelf apps, one aimed toward adults (Top Shelf) and one aimed toward children and parents (Top Shelf Kids Club), to buy comics. And die-hard digital fans can still utilize third-party apps like ComiXology, Graphicly, or Comics+ to grab Top Shelf's comics. This allows Top Shelf to serve three different groups: people who are curious about comics, Top Shelf fans, and people who are already familiar with digital comics. It's a wise move, and the sort of model that I'd like to see more comics companies adopt. The more places you put a comic on sale, the less likely it is for an interested consumer to walk away confused or unfulfilled. And he beauty of digital comics is that they are available all the time; they don't have print runs or shortages, and they don't sell out at retail. The only risks are the comic not being available due to technical issues or not being compatible with your device, but thanks to Top Shelf's multi-pronged approach, its catalog should be available no matter how you choose to read digital comics, whether via iOS, the web, or Android (the latter two thanks to Google Books and ComiXology). A nice side-effect of having the product available on so many services is that it creates competition, which is great for the consumer. This forces those services to compete for your money, whether by creating attractive features or running sales. Google Books is ahead of the game on that front. It currently offers Jeff Lemire's The Complete Essex County, which is about five hundred pages long, for $8.54, significantly less than its $14.99 MSRP. Kagan McLeod's Infinite Kung Fu is just $9.99, around 25% less than its usual $12.99 asking price. I'd like to see more publishers (or individual creators!) exploring what Top Shelf Productions is doing here. I think they've got a pretty healthy way of looking at the digital market, and you'd have to be a fool not to want Top Shelf's incredibly diverse library digitally present and accounted for.